One of the best features of Safari on desktop or mobile is the Reader mode, that extracts the basic text and the relevant images from a web page and presents it in a more readable manner, free of distractions such as advertisements and odd font choices. Google has been working on something similar for Chrome. They already added it in Chrome for Android a while back but oddly you have to mess around in chrome:flags to enable it. 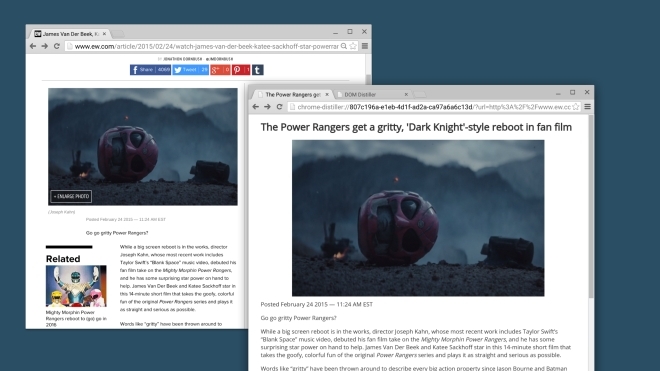 Now they are bringing it to Chrome for desktop and you can use it with more fiddling around. On desktop it’s even more work to use this feature right now, as you have to install the DOM Distiller from here, at which point you will see the ‘Distill page’ menu item in your Chrome. That will let you use the reader mode for the webpage. Of course, this feature should come formally with a more user friendly switch in future but if you want to use it right now and for some reason don’t want to use one of the many Chrome extensions that can already do this (such as Clearly) then give this method a try.